504 Main by Holly Lefevre: The Day Started Off Awesome! Time again for Writer's workshop over at Mama Kat's! feel free to make one up"
(hmmm...I am sensing a pattern). Today started off great. In second period, Mrs McGee brought in her computer for us to work on. It is so cool because we are the only class in the whole school that gets to work on a computer. It is called an Apple. I have my Texas Instruments computer at home but I only have a typing program and I am soooo bored with it. Then my day just got bad. It sucked! Terry showed up in the same outfit. I mean she knows I shop at Contempo. She knows I went shopping this weekend and l was totally excited about my new outfit. I even have totally cool earrings and socks to match. She does this all the time. I do not want to hang out with her anymore. Jennifer and Gary are going-around now. He is so cute, but Ramon is cuter! He is a babe! He said hi to me today. There is a big birthday party at Stephanie's this weekend. I am going to ask Chris to do my hair. She is really good at it. Maybe Ramon will come. He hardly ever gets to go to parties, but maybe he'll be there. He is a babe! Maybe I can talk my dad into going shopping with my mom and I. I need a new outfit for the party and he always buys me something even when mom says no. Off now to make posters for the student council elections. I love that!! Was that a picture of you?? is that a Picture of 80's Holly??? oh the memories of teenage years! He's a babe! :) Love it. It was all about the boys! Good times Holly! Simpler times! Ah yes, Contempo! Loved that store! Remember Clothestime? It only aspired to be Contempo! oh my! I laughed and remembered j.high the whole way through that! thank you! LOVE the computer reference!! Could you imagine a life without the internet!! My dad was a sucker too, always was, still is! That is not me...I am not brave enough to post a 13 year old photo...at least not yet. Let me have a glass of wine. I was going to gush over how cute you were till I read that it isn't you. You sounded cute, though. I had to match my socks and jewelry back in the day, too. By popular...or unpopular demand..the photo is now me! I must be getting braver! You did a great job getting the whole lingo of a 13 year old down!! I loved this! Totally. Everything you said in this entry, I remember saying myself. Ahhh memories. haha. Like totally, I so understand when somebody like totally copies you. Did ya' ever hook up with Ramon? This is so funny! I never kept a journal when I was younger, although I wish I did. I would love to look back on it now! That's kind of why I am glad that I am keeping a blog, now, I guess. Thanks for stopping by my blog. Your blog is lovely (and I love the design). You were SO not 13 in that photo! Keep the sweater though because its totally coming back into style! okay, wait---you have to be older than 13 in that pic, right? Also, I'd totally forgotten about CONTEMPO! That store rocked my world, too! That picture of you is just awesome! I love the sweater! I love your diary entry! The Apple! ah! I loved this post! It's like, totally 80's! I don't know what ever happened to my diary. I found out that my mom was reading it, so I started posting things like "I went to the mall with Wendy" instead of what I was really up to! Was "going-around" what you called dating when you were in school? We called it "going together". My son and his friends call it "going out". Contempo Casuals! LOL I used to love to shop at 5.7.9.!! That is when I could easily fit into a juniors size 5! Holly, I am pretty certain--almost positive--that I had that same sweater!! ah, life was so simple back then, huh. hahahah that's so funny. So cute to know the thoughts back in the day. happy friday! Cute photo, is that you from the 1980's? Love the observation that dad buys when mom says no! Great dad you have! Thanks for sharing, these are always so funny to look back on! 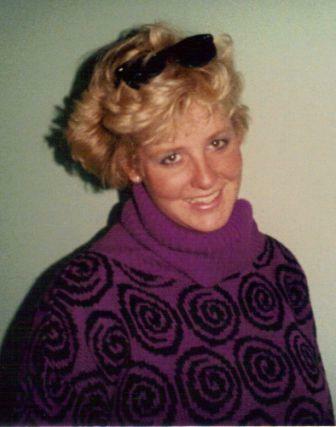 Gotta love the 80's Holly ... nothing like blue eyeshadow and permed hair ... those were the days. You must be the same vintage as me ... a 1971 model? Nothing like the good old 1980's! Was that you in the photo? BTW, loving the new header and background! Yep Holly, it does sounds like a young teen girl. A very normal one. Raised two of them, so been there, heard that. Great pic and flashback. Totally sounds like 13. Contempo - blast from the past. Hey, I like your new header pic. Happy SITS Saturday Sharefest! omg, Contempo! Blast from the past!! I'm curious if you won the election! Great blog! Looks like fun over here! I love the flashback post--brings back memories of my own. Thanks for stopping by today! Why on earth would you need a new outfit when you had that awesome sweater. 80s style makes me so happy! Ok, no way is that a picture of you at 13! If it is, then you were very sophisticated for that age. At 13, I looked just a little bit older than I did at 12, braces and all, and I had no chest.